This is it! The grand My-Life epic! "The Case of the Stolen Credit!" This is the beginning of a storyline that began in early 1994 and didn't wrap up until Thanksgiving of that year! (keep in mind the Lantern was only printed monthly and wasn't published for four months out of the year) Even though this entry is a rather weak comic strip by itself (in my opinion), we have to start the story SOMEwhere...so this little booger was published in the Revere High School Lantern on February 18, 1994. I do not know where I came up with this idea, but at the time I must have thought it would have been funny if one day, My-Life's "Created by" credit was gone. 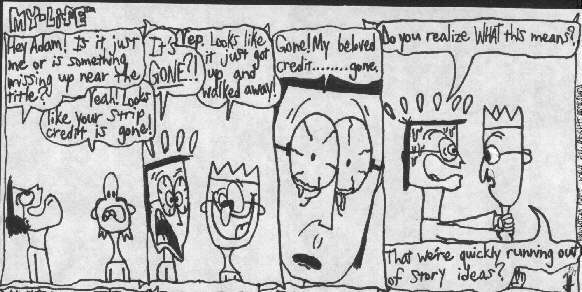 When the strip was published, the drawn logo at the top was replaced by a "typed" title...and I had to explain to the person working on the comic page why they cannot put "by Greg Method" next to the words "My-Life." They trusted my ramblings and left the byline off throughout the duration of the storyline. It's a good thing My-Life only appeared in one newspaper at the time....let's see Mort Walker ask every newspaper to remove his name from Beetle Bailey just for the sake of a storyline! Also, this storyline (this strip in particular) broke down some walls that were pretty much previously unbreakable in the My-Life world. It's natural for comic strip characters to say a quirky aside or two to the reader, but to notice that something was wrong outside the panels?? Gasp! And to have the "Greg" character become upset by his missing name credit leads one to wonder if for the whole time, have My-Life readers been following the life of a fictional character, the strip's creator, or both? Confusing, huh? The whole idea is very Bloom Countyesque, don't you think? Well, maybe not. It was in this storyline that I began to play with facial expressions. Before, I was too busy trying to define the characters and make the images clear when shrunk to worry about if they were drawn funny or not. Greg alone goes through many different moods in the storyline: wonder, shock, worry, suspicion, helplessness, befuddlement, etc. This is his defining storyline...and it's about time, too! Adam, Andy, and the rest had plenty of long opportunities to display their characters...now it's Greg's turn!